The Legacy of Alexander the Great is brought to life on King Of Macedonia Slot. This game is not only one of the best creation of IGT but also one of the latest online slot machines developed. 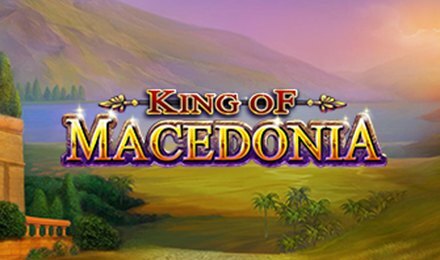 King Of Macedonia Slot is based on a live slot originally launched in 2016. It presents Alexander in all his glory. The top-notch graphics of the game bring you to an immersive gameplay. King of Macedonia is a Video Slot packed with five-reel. Want to know why this is one of the best game by IGT? Check it out below. Kick-start your gaming journey on King Of Macedonia Slot by logging onto your Vegas Spins account on your preferred device. Once this is done, you can set your desired stake value. You will also see the magnificent symbols such as Queen, King, Helm, Horse, Chalice, Box, Harp, Vase and Parchment on the reels of King Of Macedonia Slot. These symbols could help you generate winning combinations if they appear on an active pay line. As soon as you are done with the stake value, you can click on the Golden Spin Button to get the reels in motion. Bet Levels: On King of Macedonia Slot, there is no Bet Level available. Amount of Paylines Selection: King of Macedonia Slot is played on 40 paylines. However, you will not be able to alter the 40 paylines during any gameplay as these are fixed. Coin Values: To access the betting option, click on the Total Bet button. You can choose to stake a minimum of 80.00 up to a maximum of 24000.00 per round. The King Symbol acts as the wild symbol. It chips in for any other symbols in the game except for the Bonus Symbol. It can also appear as stacked symbols exclusively on reels 2 and 4. The Bonus Symbol on King of Macedonia Slot is represented by the Golden Shield Symbol. When a Bonus Symbol appears on reel 1 without any wild symbols on the other reels, you can be awarded a random multiplier of up to 10x. The King Free Spins Bonus is activated when a Bonus Symbol lands on reel 1 and one or more Gigantic Wilds appear anywhere on the reels. This will award you 8 Free Spins. Relish the sensational King of Macedonia Slot by IGT. Best of Luck!